how you love to travel far. Now it’s time to go to bed. But you want to drive instead. It’s time for Little Car to go to sleep, but he isn’t tired yet! So he cruises around town saying goodnight to all of his friends, from the tractors in their shed to the buses and taxis in town to the cranes and diggers at the construction site. Finally exhausted, Little Car putt-putts home where at last his beep-beep dreams begin. Kate Dopirak loves walking her puppy, watching her sons play basketball, and convincing her husband to share a cheese plate instead of wings. She also loves to write for kids. 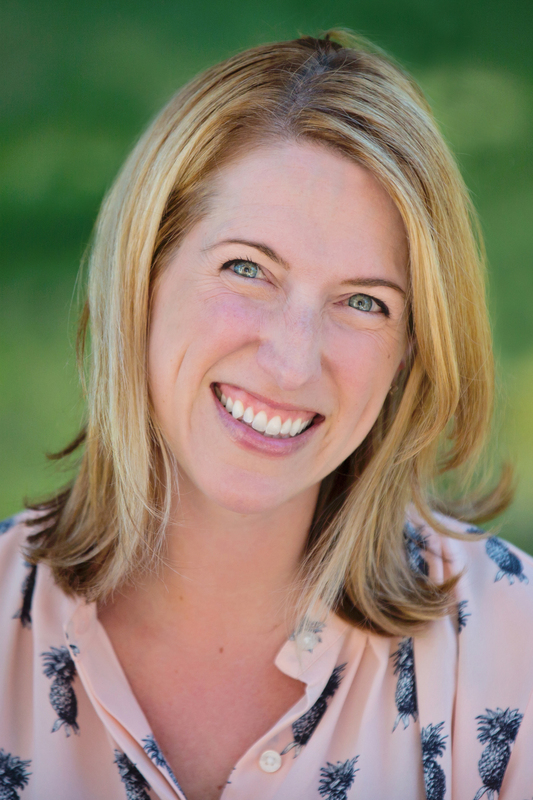 Kate is a teacher, a reading specialist, and the Assistant Regional Advisor for Western Pennsylvania SCBWI. She is the author of You’re My Boo and Twinkle, Twinkle, Little Car. Visit her at KateDopirak.com. Dopirak (You’re My Boo) and Peterson (Dig In!) team up for a soothing and smartly executed vehicular riff on a familiar lullaby. The title character—a cheerful, googly-eyed convertible—decides to go out for a nighttime spin: “Twinkle, twinkle, little car,/ how you love to travel far! Now it’s time to go to bed./ But you want to drive instead.” Cruising into town, the auto gives good-night beeps to its pals: tractors dozing in a shed, big machines wrapping up work at a construction site, wide-awake emergency response vehicles on call, and a parade of “trucks and taxis, buses too.” Despite all of the racing around, Dopirak keeps the mood even-keeled, and the subdued palette of Peterson’s digitally colored linoleum block prints does the same. Her chunky nighttime scenes are dominated by swaths of muted gray-blue that contrast with bright white headlight beams and a looping golden road. Even the vehicles’ interspersed honks and sirens never get too rowdy, printed in a small, almost polite font. A little red car wants to keep driving instead of going to bed. He cruises around to say goodnight to other vehicles. The little car meets tractors, an airplane, a fire engine and others during his nighttime adventure. This book is a great bedtime read-aloud. 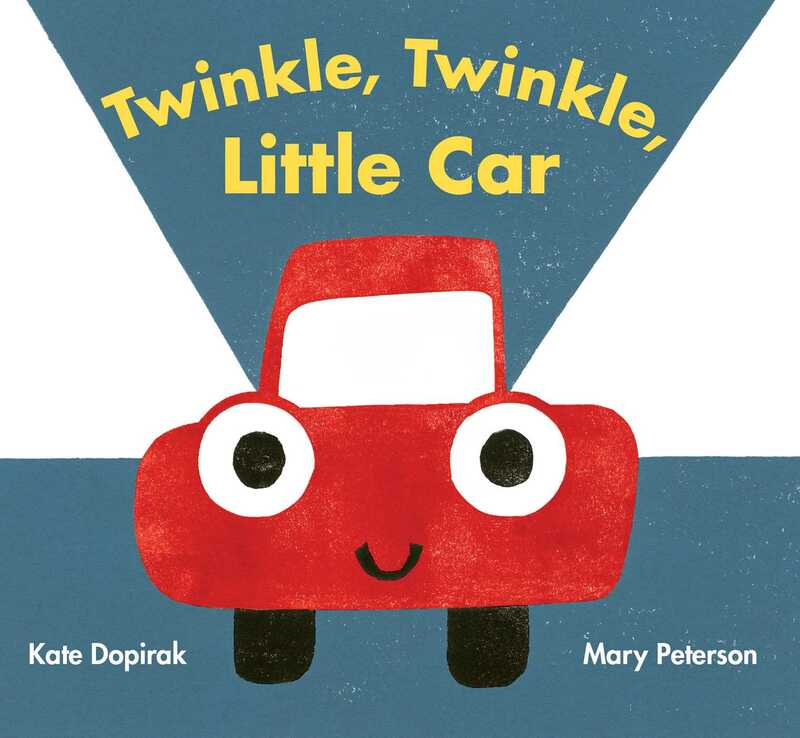 The narrative’s rhyming structure can be read to the tune of “Twinkle Twinkle, Little Star.” Vehicular sounds are sprinkled throughout, adding another fun and educational element to the text. The car’s large round eyes are a focal point, and all of the vehicles sport notably cheerful expressions. The clever use of light is also noteworthy. Light coming from the vehicles is heavily emphasized with bright triangular shapes, adding a vibrant visual element to the dark night sky. The illustrations are done with combinations of geometric shapes. They also feature an abundance of primary colors. These bright colors pop against the book’s dark nighttime background. VERDICT A unique twist on a pleasantly familiar tune and an appealing bedtime read-aloud, especially for vehicle lovers.